The historical role of interracial marriages has been the subject of much discussion in recent years. In 2016, Amma Asante’s beautiful film, A United Kingdom, introduced viewers to the romance between King Seretse Khama of Botswana and Ruth Williams, a white British woman, who met in the 1940s, fell in love and decided to get married, despite huge public outcry from their respective homelands. That very same year, we were also treated to Loving, Jeff Nichols’ take on the story of Richard and Mildred Loving, a US couple arrested for unlawful interracial marriage in the 1960s. The Lovings’ legal battle against the state of Virginia ultimately led to the invalidation of the laws prohibiting interracial nuptials. Yet long before Khama and Williams’ royal romance and the Loving’s historic victory, there were other brave couples who dared to defy laws in their pursuit of love and happiness. While many such cases were recorded in the annals of history, it was not until the late 19th and early 20th centuries, that interracial marriages were visually documented. Frederic and Helen Pitts Douglas, Charles and Hester Meehan and Josephine Cogdell and George Schuyler were only but a few of the forward-thinking individuals who not only opted for a life together, despite society’s hostile attitudes, but also left photographic evidence of their happy marital lives. Frederick Douglas escaped slavery and rose to become one of the leading abolitionists of his time. An excellent orator and writer, he was an intellectual luminary and years ahead of his time. In 1884 Douglas married Hellen Pitts, a white suffragist and human rights fighter. 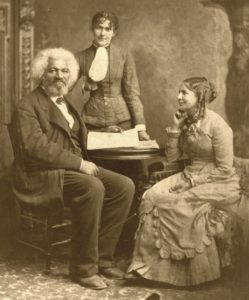 Together, the couple took a stand against slavery and campaigned for women’s rights. Here, Douglas is pictured with Helen (right) and her sister Eva (centre). According to a family historian, the Meehans were childhood sweethearts, who met in 1864 when they were both eight years old. Their connection was so strong that they spent their whole lives together. 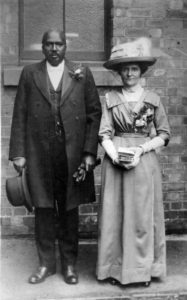 Charles was allegedly so in love with Hester, that he could not even imagine marrying another woman and “spoiled her to the point that neighbors were jealous.” The couple married in Canada where interracial marriages were allowed by law. Later, they relocated to the US with their three children. Josephine Cogdell was an heiress of a rich Texan family. Although her ancestors had made much of their wealth by exploiting slave labor, Codgell was a firm believer in equality. 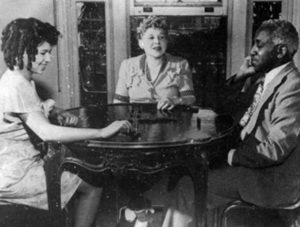 She began an active correspondence with George Schuyler, a black left-wing journalist. Eventually, the two met face to face and married in 1928. 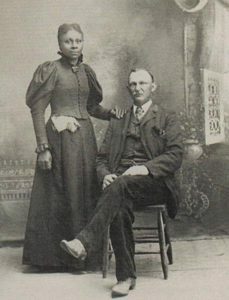 Codgell described herself as “colored” in their marriage certificate, in order to avoid legal persecution. Here, the couple is pictured with their daughter Philippa, a child prodigy, who later became a prolific musician and journalist. For more beautiful historical photographs, immortalizing the many interracial couples who bravely fought to have their love accepted by society, click here.